"Erwin Raisz called cartograms 'diagrammatic maps.' 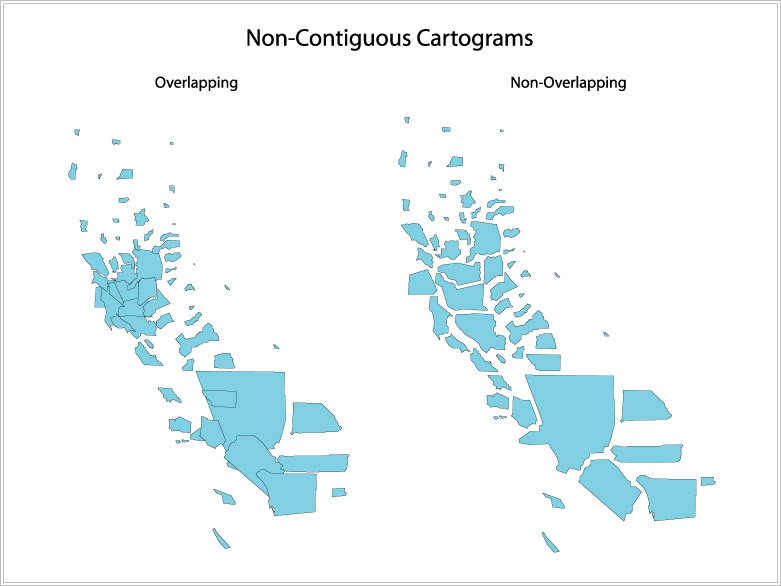 Today they might be called cartograms, value-by-area maps, anamorphated images or simply spatial transformations. Whatever their name, cartograms are unique representations of geographical space. Examined more closely, the value-by-area mapping technique encodes the mapped data in a simple and efficient manner with no data generalization or loss of detail. Two forms, contiguous and non-contiguous, have become popular. Mapping requirements include the preservation of shape, orientation contiguity, and data that have suitable variation. Successful communication depends on how well the map reader recognizes the shapes of the internal enumeration units, the accuracy of estimating these areas, and effective legend design. Complex forms include the two-variable map. Cartogram construction may be by manual or computer means. In either method, a careful examination of the logic behind the use of the cartogram must first be undertaken." A cartogram is a type of graphic that depicts attributes of geographic objects as the object's area. 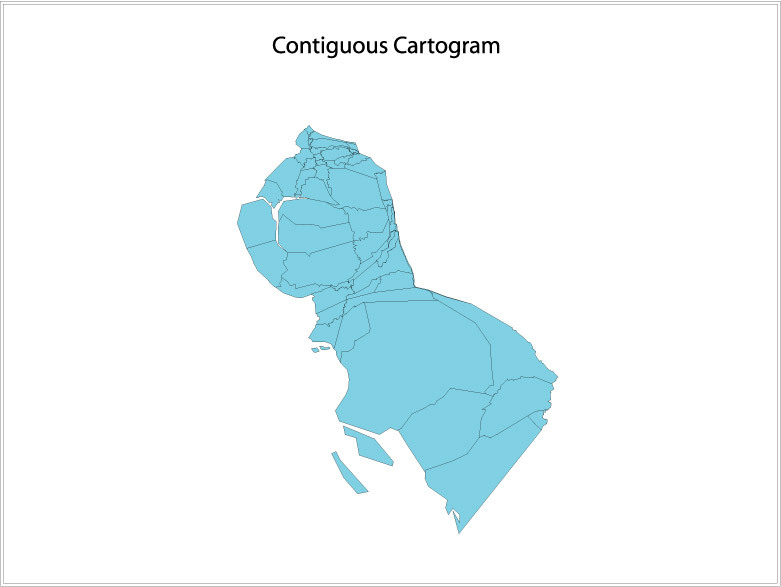 Because a cartogram does not depict geographic space, but rather changes the size of objects depending on a certain attribute, a cartogram is not a true map. Cartograms vary on their degree in which geographic space is changed; some appear very similar to a map, however some look nothing like a map at all. 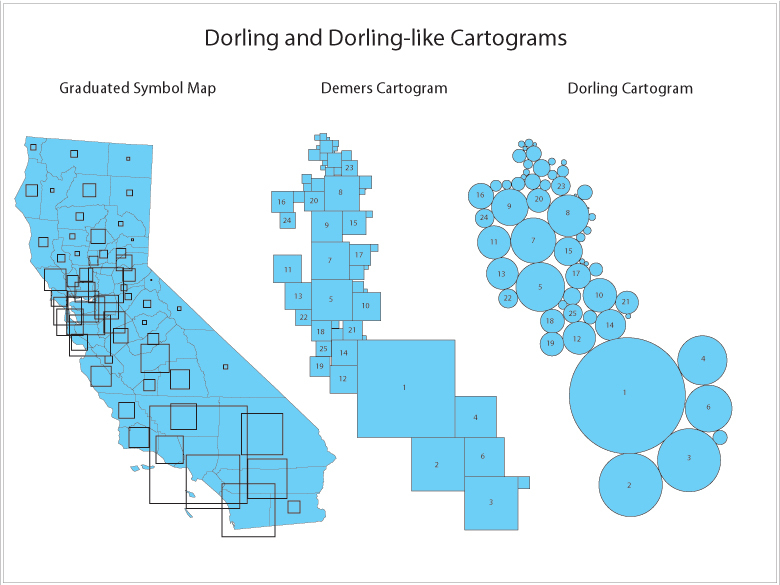 There are three main types of cartograms, each have a very different way of showing attributes of geographic objects- Non-contiguous, Contiguous and Dorling cartograms. Geographic Object: Some thing that exists in geographic space, like a country, a city, a river or a house. Attribute: Some characteristic of a geographic object; such as a country's population, its literacy rate, or Gross National Product. Pseudo-cartograms (or false cartograms) are representations that may look like cartograms but do not follow certain cartogram rules. Perhaps the most famous type of pseudo-cartogram was developed by Dr. Waldo Tobler. In this case, instead of enlarging or shrinking the objects themselves, Tobler moves the object's connections to a reference grid such as latitude or longitude in order to give the same effect. This maintains good directional accuracy in the cartogram (if county A is directly north of county B, it will still remain directly north in the cartogram. Note in previous examples, such as the Dorling Cartogram, this is not always true) however, this is a false cartogram because it creates extensive error in the actual size of the objects. Let us consider this error where it becomes very clear, in the case of the California population. Mono County is a very lowly populated county, with only 13,000 people but by pure coincidence it lays at the same latitude as San Francisco County (777,000 people) and at the same longitude as Los Angeles County (9,519,000 people.) It would be impossible to expand the latitude and longitude lines to make Los Angeles and San Francisco the appropriate size without in turn, expanding Mono County as well. In the same way, the lines cannot be contracted to make Mono County the appropriate size without making San Francisco and Los Angeles too small. Dr. Tobler uses a root mean square calculation to find the "best fit" or cartogram that is "close enough." This technique is sometimes used to pre-process a contiguous cartogram. That is, let a computer make a pseudo-cartogram, and from this a cartographer can create a contiguous cartogram by hand. This also proves to be very effective.